A RARE OPPORTUNITY TO OWN A STEVENS CUSTOM 42! This highly desirable cruising/live aboard vessel is the combination of Bill Stevens (builder) and Sparkman & Stephens (designer) and is a sure winner. 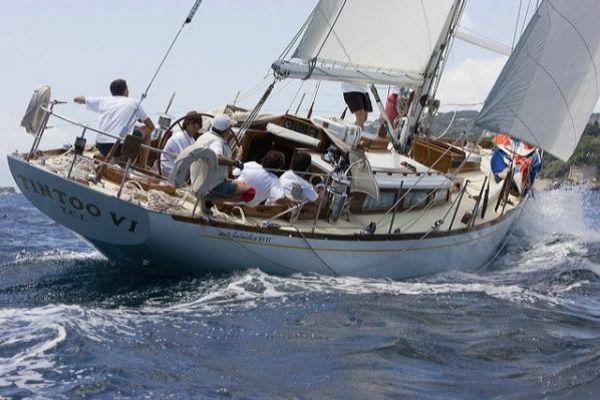 She has beautiful lines, is easily handled by a couple and a pleasure to sail. Boasting solid, durable construction with robust rigging and features, she is built to sail the world with amenities to keep you safe and very comfortable. And a REAL PLUS…NO EXTERIOR TEAK to maintain! This vessel has been extremely well maintained with many upgrades and constant TLC. The past 20 years of maintenance have been accurately logged. With an exceptionally large aft cockpit, overnight passages are a breeze with room for comfy snooze while off watch. Entertaining is easy with plenty of room for happy hours. The interior is light, open and spacious; not “chopped up” and compartmentalized like many boats her age. Her fore/aft center island double sinks give the galley an openness rarely found on boats this size. There is ample, well thought out storage throughout and plenty of ventilation to keep the interior fresh. Easy and complete access to the engine, water and fuel tanks make them a breeze for routine inspection and maintenance. Since 2007, she has been hauled out of the water and stored for approximately 6 months each year during hurricane season. Routine bottom paint and thorough inspections take place before she is splashed for the new season. If you want a comfortable live aboard, or you’re dreaming of sailing over the horizon, “Casa Del Mar” is a MUST SEE! West Florida Yachts would love to guide you through a personal showing of this 42' Sparkman & Stephens 42 1987. This yacht for sale is located in New Bern, North Carolina and priced at $99,999. For a showing please contact us by filling out the form on this page and we will get back to you shortly! Step onto the side deck by way of the oversized fold down boarding ladder and gates. The side decks are wide and offer excellent maneuverability fore and aft. The cockpit is large and has plenty of seating with Blue Sunbrella cushions and protection by the Sunbrella blue bimini, dodger and connector. Storage lazarettes are under the seats and the helm offers a panoramic view of the surroundings. At the helm is a beautiful stainless-steel pedestal and destroyer steering wheel and all controls, gauges and electronics are within easy reach. The companionway has a thick drop in door and the lower edge folds down out of the way. A few steps down and you enter the large and comfortable main cabin. Immediately in front of you is the engine compartment that is protected and covered by the double sink and stainless-steel counter a galley cabinet. The cabinet will fold up from fore to aft and reveals complete 360-degree access to the engine compartment. The L-Shaped galley is along the port side with plenty of space for food preparation and storage. The large, top-loading, refrigeration and freezer compartments are aft. The onboard chef will find the galley inviting and a pleasant place for food preparation. Across from the galley and aft is the quarter-berth. The berth is large and has outboard storage and drawers under the berth forward. Forward is a cabinet for storage and a hanging wet locker. Forward and to starboard is the navigation station with access to the electrical panel and a top-opening desk. The salon is massive and has plenty of outboard storage with cabinets, shelves and opens areas. The centered dinette table leaves fold neatly out of the way and when extended can easily seat 8. Along the port side is a L-Shaped settee with storage behind the back cushions and to starboard is a long settee with storage behind the back cushions. Forward and to starboard is a cabinet or storage and a liquor locker in the upper cabinet. Across and to port is the head with teak grates on the floor, ample countertop spaces and a hand-held shower compartment. The head has a privacy door. All the way forward is the stateroom with a V-Berth that has a single large mattress. Outboard are storage cabinets and opens spaces. The walls are covered with beautiful wood slats. There are drawers aft of the berth and a small settee to starboard and a hanging locker and cabinet with storage. The interior features teak and holly flooring, louvered doors and beautiful matching fabrics. Type - Modified keel with skeg hung rudder. Hand laid mat and roving fiberglass one-piece hull with longitudinal stringers (4 per side). Heavy bronze casted rudder gudgeon and skeg. Deck - Fiberglass plywood core with molded in non-skid areas. Hull to Deck Joint - The deck overlaps the inward flange of the hull and is secured (thru a heavy-duty aluminum toe rail) with stainless steel bolts on 6” centers. The entire joint is fiberglassed over on the inside for both waterproofing and to add additional strength. Internal - There are 3 main bulkheads along with a forward chain locker bulkhead. All are well tabbed to the hull and adjoining members. Mast Support - The mast is keel stepped atop a reinforced stainless-steel floor plate which encompasses a stainless-steel cup type fitting where the mast is secured. Staysail hankon Lazy jack system for main sail Boom brake system Running backstays Heavy duty oversized standing rigging system. 90% of Running rigging replaced. There is EASY and COMPLETE ACCESS to all sides of the engine! Fresh Water Tanks: 190 gallons - Two integral fiberglass tanks (1 port and 1 starboard) installed under settees with baffles and removable stainless-steel inspection plates. Alternating between tanks is a simple, easy access levers and water manifold system. Fuel Tanks: 90 Gallons – Two integral fiberglass tanks installed in the main bilge forward of the engine. Each tank has a stainless-steel removable inspection plate. Alternating between tanks is a simple, easy access lever. Holding Tanks: One 6 Gallon polyethylene located under head sink. Standard deck pumps out access. Propane: 2 - 10 lb. aluminum certified LP bottles with O.P.D. (overflow protection device valves). Too many extras to list including extensive spare parts inventory (pumps, hoses, gaskets, electrical wire, engine items, lines, etc.). There is a complete log of all maintenance and replacements over the last 12 years onboard the boat! You will not be disappointed in this boat! If you looking to cruise in safety and security, you owe it to yourself to see this boat! A great liveaboard or cruising boat, CASA DEL MAR is ready to go!